Researchers at the California Institute of Technology have turned science fiction into reality with their development of a super-compact high-resolution microscope, small enough to fit on a finger tip. This "microscopic microscope" operates without lenses but has the magnifying power of a top-quality optical microscope, can be used in the field to analyze blood samples for malaria or check water supplies for giardia and other pathogens, and can be mass-produced for around $10. "The whole thing is truly compact--it could be put in a cell phone--and it can use just sunlight for illumination, which makes it very appealing for Third-World applications," says Changhuei Yang, assistant professor of electrical engineering and bioengineering at Caltech, who developed the device, dubbed an optofluidic microscope, along with his colleagues at Caltech. The new instrument combines traditional computer-chip technology with microfluidics--the channeling of fluid flow at incredibly small scales. 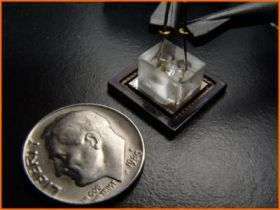 An entire optofluidic microscope chip is about the size of a quarter, although the part of the device that images objects is only the size of Washington's nose on that quarter. "Our research is motivated by the fact that microscopes have been around since the 16th century, and yet their basic design has undergone very little change and has proven prohibitively expensive to miniaturize. Our new design operates on a different principle and allows us to do away with lenses and bulky optical elements," says Yang. 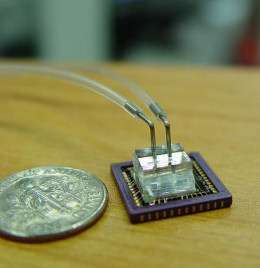 The fabrication of the microscopic chip is disarmingly simple. A layer of metal is coated onto a grid of charge-coupled device (CCD) sensor (the same sensors that are used in digital cameras). Then, a line of tiny holes, less than one-millionth of a meter in diameter, is punched into the metal, spaced five micrometers apart. Each hole corresponds to one pixel on the sensor array. A microfluidic channel, through which the liquid containing the sample to be analyzed will flow, is added on top of the metal and sensor array. The entire chip is illuminated from above; sunlight is sufficient. When the sample is added, it flows--either by the simple force of gravity or drawn by an electric charge--horizontally across the line of holes in the metal. As cells or small organisms cross over the holes, one hole after another, the objects block the passage of light from above onto the sensor below. This produces a series of images, consisting of light and shadow, akin to the output of a pinhole camera. Yang is now in discussion with biotech companies to mass-produce the chip. The platform into which the chip is integrated can vary depending upon the needs of the user. For example, health workers in rural areas could carry cheap, compact models to test individuals for malaria, and disposable versions could be carried into the battlefield. "We could build hundreds or thousands of optofluidic microscopes onto a single chip, which would allow many organisms to be imaged and analyzed at once," says Xiquan Cui, the lead graduate student on the project. The paper, "Imaging microorganisms with a high resolution on-chip optofluidic microscope," will be published July 28 in the early online edition of the Proceedings of the National Academy of Sciences. sounds great I want one. Wow. Thats all you gotta say to this innovation? This is another importatn tool made avaliable cheaply to the masses. In the music industry, the emergence of the DAW(digital audio wokplace) for the computers allowed individuals to set up home studios and with very little equipment can do all the recording at home without dishing out $$ for time in a Professional Recording Studio. As the DAW popularity is increasing geratly the major recording studios will suffer. I just wanted to make a parallel with this super-cheap microscope. Professional tools avaliable cheaply are changing the way innovation is made, and the way business is done. Microfluidics is never easy to work with, especially the interface to the macroscopic world. The imaging technology sounds interresting though. Um, yeah...I'd second that Wow and follow it up with a...if this is so great, why not show an image or two of what the device is capable of producing? This is the second article I've seen on the technology that has had no available images. I'd have to say, "What's up with that?" But in a nutshell...Wow. If an actual product that works, it is pretty cool. But we do live in an age of "things that are pretty cool happening just about every day," so understated excitement about such things is understandable. Don't you think? Just my two cents.